To the best of my knowledge Jack Fowles ( John Patrick Fowles 1892 – 1977) who is my great-grand uncle did not have these memoirs of his published? I for one think he was a fabulous narrator. I was given a hand written photocopy many years ago and have attempted as best as possible to transcribe them here for the simple enjoyment of all. It’s worth noting that when Jack’s father died he was a young boy. He took on farming and was in my grandmothers words ‘a boy of the bush’. He never married but I understand was a great support to his mother throughout her life and a highly regarded dairy farmer in the districts. Up until the age of six or seven my mother’s families farm ran alongside his in Korumburra, before my grandfather – who was a boy of the city not the bush sold up their farm and they moved away. I have a very distant memory of having met ‘Uncle Jack’ as a young child when visiting family in Gippsland. I’ve deliberately not adjusted the speech used and I’ve only made spelling changes if absolutely necessary. In the year eighteen and eighty two where the hill country midway between Leongatha and Warragul now stands was thrown open for selection by the Victorian Lands Department. Would be Selectors applied from all parts of the state and applicants had to appear before the land board on a certain day at a named place by the board to hear their reasons why they should become the owner of the selections. As many as fifteen applications were to be heard on some of the blocks. The terms of purchase being very attractive. One pound per acre and spread over a period of thirty one years. Each block of land had to be occupied by the owners or some other person instructed by the owners within three months of being notified that they had been selected as owner of the block. Two Surveyors Walker and Skinner had been working for two years for the Lands Department surveying all of this area of country into blocks ranging from three hundred and twenty acres down to one hundred and fifty acres. The soil is good to fair agricultural and grazing lands exceptionally well watered by creeks and springs and offers wonderful shelter to both man and stock owing the hilly nature of the land and is seldom known to have a frost although occasionally one does come in the valleys snow is not unknown here there being a light fall now and again generally in the late winter. The Pioneers soon learnt the ins and outs of the new country being twenty miles out in the bush from the nearest store. And bush it was being amongst the heaviest in the whole of Gippsland and no road until they themselves cut a pack track on to their selections. The method used was to turn here and there wherever it was reasonably level going, and when they could not do that it was a case of going straight up and down. As it proved in later years to be grades of one in size in a lot of places for half a mile distances then with the axes carried in then back chop off all the undergrowth at ground level and packed it along each side leaving about ten feet of a track in the centre. When these pack tracks were completed one just seemed to be going along through the forest with a brush fence for company on each side. The Settlers dwellings was easily erected in those days owing to the quantity of timber being suitable all grown within a couple of chain of wherever they wished to build, those generally being close to a good water spring. Many of these shanty’s as they used to be called by their owners were built of a double wall of poles and then packed in between with ferns or bark to keep out the wind which was very little in those days owing to the density of the trees and undergrowth. The roof was of slabs of bark cut in about six foot lengths from the giant Mountain Ash and Blue Gum trees that grew to perfection all through the hill country. No floor was ever thought of in those early settler shanty’s and the most of these no chimneys either. A fire out in the open served the purpose in most cases as long as the dwelling was going to last which was generally under twelve months. Then having somewhere to call their home they would start to clear the land they went through amongst the big trees and cut all the undergrowth which consisted mostly of Dogwood Musk and Wattle on the high ground and Blackwoods and Wattle in the valleys. Everything up to about a foot in diameter was felled by chopping those off about two foot from the ground and falling them in all directions made a perfect body of material for a fire. All the big trees many of which were over forty foot in circumference at ground and one hundred and fifty feet high were all ring barked. This was done by going around the tree and chopping all of the bark about a foot wide right round the tree bout four foot from the ground. This operation caused the old giants to die and shed their bark and leaves as it stops the sap from travelling into the bowl of the tree. With all undergrowth cut and back and leaves on the ground for a few months of dry warm weather it was generally set fire to about January with a good strong northerly wind and once fire got a good start on with a wind it would clean up all of the scrub that the Selectors had prepared. Sometimes two or three land owner’s plots of cut scrub used to all join in to each other making it to about one hundred acres. When one Selector’s cut scrub was set on fire his neighbours used to burn at the same time. These fires could be seen from a great distance by the great volume of black smoke that used to rise many hundreds of feet into the air in the daytime and by the red reflection that appeared in their direction after sunset. Even with a good burn there was always a large quantity of wood left on the ground and overhead the usual thing was to go over the burn and stack all the timber up to a certain size in heaps and ‘burn it off’ through the summer and autumn as much as could be done before it was time to sow it down with grass seed. Which generally consisted of Cocksfoot, Ryegrass and white Dutch clover once they had twenty or thirty acres sown down it was no trouble to cut sufficient seed each year for their future requirements as it used to grow grass and clover to perfection in the ashes of the newly burnt land in spite of the wallaby’s and the wombats which was wall through this portion of the country in thousands in the first years of the Selectors and upheld their reputation as stayers for at least thirty years after the first settlers came to the district. The wombat was an exceptionally hard animal being about four times the size of a koala bear, used to have their burrows in the ground for sometimes as far as one hundred feet and nothing could interfere with them. It used to seem strange to go into a newly burnt piece of the one hundred acres or more where a heavy fire had just gone over a couple of days previously and see the old and the young wombats walking about amongst the fire charred logs but they would soon move off into the standing bush and make new homes. But when the burrows was sown down to grass and good feed came on the ground they or some of their relations would return to the old burrows and grow bigger and fatter than ever. After the first few acres was put down to grass the landowners next thought was their permanent home and buildings. Their houses in most cases consisted of four rooms all in a row of about twelve foot square which made the house about fifty feet long with a big wooden chimney at one end of the building about four feet by six foot. All building materials being split on the property. Slab walls and flooring and a shingle roof they being split with the paring knife. The trouble being wonderful good splitting, terrible messy if the roof leaked. Walls were lined with hessian and a wallpaper pasted all over the hessian wall which was usually the daily or weekly paper in most cases and made the farmers very comfortable in their farm buildings. Buildings had to be all built in the same way the only thing not grown on the land being the nails. Like everything else that had to be brought in by farmers on the pack horse, which was a very great friend to the settlers in the pioneering days of all of Gippsland. I have seen in later years a horse jogging along the track with twenty five sheets of galvanised iron, eight feet long fasted onto the pack saddle. In fact everything for the first ten years had to be both pack saddled in or walked in. The settler had to get the shed completed their thought was to get in cattle to start dairying which was the mainstay of nearly all of Gippsland in the early days. Nearly all of the cows and heifers that came to Ferndale came from Ballarat and Bacchus Marsh district. Most of them being travelled down by road. When the dairying did start, the milk was all set into dishes about eight inches deep and about two feet wide across the top. These dishes sat there for about twenty four hours for the cream that was on it being left stand for a few days and then put into a barrel churn and made into butter. After going through the butter washer it was packed in the boxes exactly one foot square. One lot on top of the other until the box or boxes was filled with enough which might mean a fortnight or so was then put onto the pack saddle and taken to the closest railway station – which was Drouin for some years but later became Warragul and was consigned to one of the top well know Melbourne Firms of those days which was W. H. Blackburn or the Fresh Food Company. Separators were practically unknown in those days. The first separator between Ferndale and Warragul was bought by (Morur?) of Sea View. It was a great contrivance different from the later (the next few sentences due to the script on the text and copy I cannot read clearly) it was like a f.. rolled oil b..turning on its side with the handle on one end and could be hand working …. and if one was in the same room as the operator the only way to understand each other was by hand signs. The first separator brought to this country was turned by horse works the former one I understand being the first type of hand separator brought to Australia from overseas about eighteen and ninety eight. The Alfa Lavel started to come from Sweden and held the pride of place for many years and proved to be a great boom to the dairying industry for its early years. The price of the new one hundred gallon Alfa Lavel in that year was twelve pounds. Quite enough I daresay with butter only four pence per pound bring in Melbourne to the wholesaler. The dairy herd comprised all breeds and colours and stayed so for many years. At that time the dairymen did not mind what colour or how many breeds were in their herd size. The same strong dairy cows cannot be reared on the same hill country today under any of the present conditions for some unknown reason to the present day farmers. The first white man to come to Ferndale was Richard Purcell and he called his farm Ferndale. That is how the district got its name. Then followed his two brothers; Felix and Pat, two well known identities of the district for over thirty five years. Lake Jubilee Falls was on Pat Purcell’s property a land mark of the district that will be there for all time that is as far as the present day folk are enamoured with its rugged cliffs and giant sandstone boulders. Richard Purcell’s property was … on the most western side and it to being of very hilly nature. On top of the highest hill north-west of the Jubilee Falls was the spot chosen by Richard Purcell to build the first house to be built in the Ferndale district. This home being removed some years later by a bush fire. Two Pinus Insignus still marks the spot where the dwelling once stood and from the same spot looking in all directions the wonderful scenery will be there forever in all seasons of years to come. Felix Purcell’s property was again north-west of Richard’s and being not quite so hilly as the other two farmers property’s , it joining on again to another notable land mark of that district that being Price’s Cliff with its rugged walls of rocks where quietly flows the Wild Dog river below it being noted in the nineties for the quantity and size of the black fish that could be taken from it with rod and line. But of later years they have become practically unknown in the same river. The first stock to be brought to Ferndale was a team of working bullocks brought in by Richard Purcell coming from the Daylesford district where he had been working them on sawmilling work before moving them to Gippsland. Working bullocks was very popular in all of the South Gippsland districts in the early years of settlement owing to their great strength and steady movement on the up and down hills unmade roads. 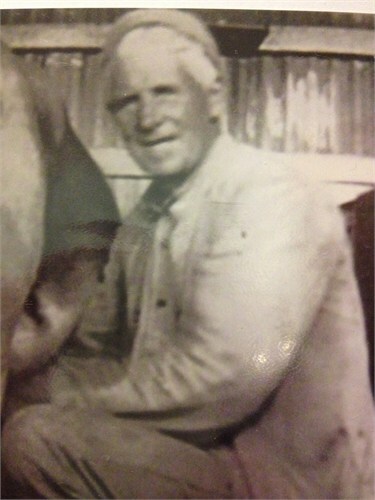 The largest working bullock owner of the nearby district was Mr John. T. Ashcroft of Sea View with forty eight head of working bullocks all doing some class of work about the different districts. He also started a grocery store at Sea View in eighteen and ninety and carried it on for a good number of years and proved to be very handy for the farther out settlers all the cartage from the town to the store brung by the bullocks. A two day trip, one day into town and one back home. His was a half-way house for all of the new settlers of the Ferndale and West Tarwin districts most of them spending their first night on the Strezlecki Ranges at his home which although nine mile distant could be seen clearly from Warragul. In eighteen and ninety two the auctioneers firm of Hugh, Allan, McLean and Co., built a sale yards about a quarter of a mile from the store with the intention of having a fortnightly sales of all classes of stock and conducted sales every second Saturday for about twelve months and then monthly for some time and quarterly later. But it eventually did not pay them to come out to the yards and it fell through altogether. From the West Gippsland Gazette; 24th June 1902. DISTRICT NEWS..Ferndale; From our own Correspondents; Winter seems to have set in at last as we have had some very rough weather lately, which has made the roads very bad.The splendid autum gave most of farmers plenty of grass to carry their stock well through the winter. Most of’the cattle are looking better than they usually do at this time of theyear. Mr. Hansen, of Warragul, held an opening sale of stock at Mr. Ashcroft’s yards at Seaview. – There .was a large supply of stock, mostly being in very good condition. A large number of cattle changed hands at good prices. It is intended to hold monthly sales. Dairying is at a standstill for awhile, some of the farmers are intending to put in milking machines for the spring, as it is almost impossible to get reliable labor. The Melbourne Chilled Butter’ Factory, at Bear Creek, has stopped for the winter also the one at West Tarwin. There will be a large number more cows milking in the coming spring. The contract lately finished by Mr. Doolan, at Worth’s deviation, finishes in the middle of the scrub. It seems strange to spend about £200 on a road that nobody can use, as it is at present, as it has no outlet. If the money had been spent on Herbert’s Hill, it would have proved a large benefit for a large number of farmers, whereas, as it is now it can only-be looked at, and not used. The yard stood there for a number of years, a portion of it being used by John Ashcroft in later years when he started a butchery and was supplying beef and mutton to the surrounding districts settlers for two pence forequarters and three pence hindquarters a pound. Fat stock in those days being very cheap compared with later years. A prime fat cow or bullock could be bought for between thirty and forty shilling a head. The same thing applied to sheep, their price for fat sheep being from five to eight shilling a head although they were scarce in all of South Gippsland in the early years of settlement, owing to the dingoes. The farmers could not keep the aged sheep let alone trying to rear the young lambs. The first sheep to come in to Ferndale was brought in by William Hucker as sheep farmer of Mt Blowhard near Ballarat. Also a Selector of a block in Ferndale that was cleared and managed on his behalf by Mr Henry Warne for over thirty years his brother William Warne selected the adjoining property and held it until nineteen hundred and sixteen the same year as Hucker’s property was sold. Both of these farms was well known to be the pick of the district. Fencing in the early days of the farms was a big task owing to fencing wire being unknown in any quantity but the two farms just mentioned stood alone in this respect both being fenced in with a three rail fence and subdivided into different paddocks with a two rail fence making it impossible for any animal to get off the place of its own accord. Those fences stood there and was admired by all who saw them for well over forty years. My grandmother gave me the above photograph of her brother before she died and wrote on the back; ‘ Jack Fowles. The eldest of nine children who took over when his father died at 45 years old. 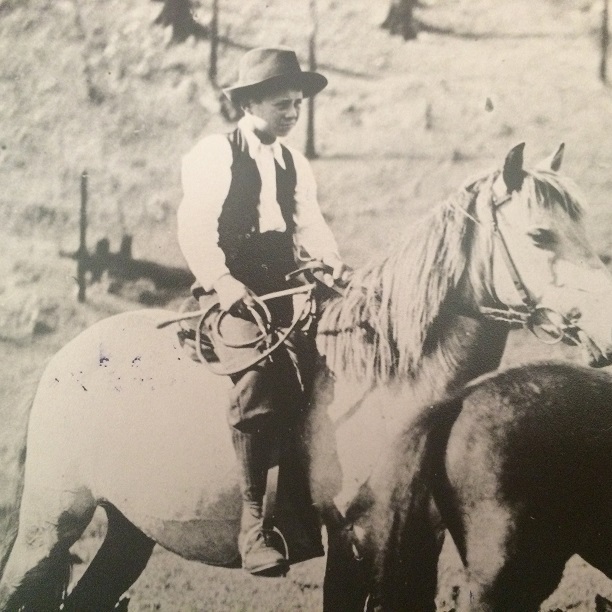 He ran the farm with his mother and 8 brothers and sisters at 13 years of age. They became very successful dairy farming in the Ferndale district. He never married but devoted his whole life to his mother and the family his father left him. (A man among men)’.